This is a recipe that was back in the archives, but is so darn good that I think it’s worth bring it back again. I made the pie last weekend and took some new photos. This is the best rhubarb pie I have ever had, for two reasons; it’s not runny when you cut it, and the flavor is unique. You must see for yourself. Ah, rhubarb, sweet rhubarb! (just kidding, of course) I’ve never tasted anything so tart in my life, and yet I LOVE it. I can’t let a spring season go by without baking something with it. 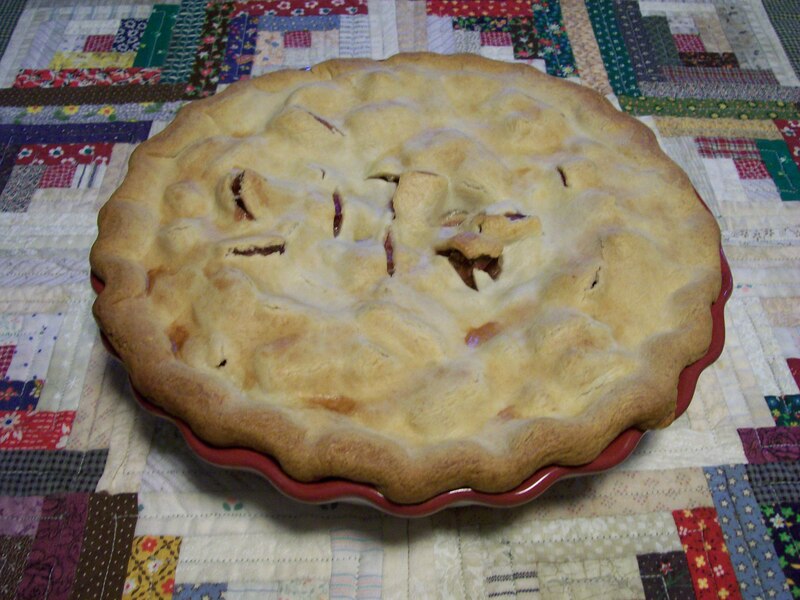 The most popular item I make is rhubarb pie–Mr. D’s favorite kind of pie; but I’ve also been known to make cobbler, rhubarb muffins and sweet bread. Last weekend I made the can’t-wait-to taste-it rhubarb pie. Try it served with a little vanilla ice-cream along side and you will hear angels singing. I call this “perfect” rhubarb pie, because it just melts in your mouth. I’ve discovered that adding some orange zest and nutmeg brings out the flavor of rhubarb, without going overboard in the sugar department. In my opinion, too much sugar just makes it taste sweet, and obscures the flavor of the rhubarb, which is what this pie is all about. We like it a little tart, so when I make it just for us, I use only 1 cup of sugar. The recipe given here is for 1 1/2 cups which I feel is quite sweet, but you can surely adjust the sugar to suit your taste. I use quick-cooking tapioca and flour as thickeners; and I also add an egg which helps bind the ingredients and keep the pie from becoming overly juicy. When baking, I place the pie on a small baking sheet such as a pizza pan in case it runs over, but really, with this recipe that never seems to happen. Pie pastry for a 2-crust 9 inch pie. You may want to use a refrigerated pie crust from the grocery store, or prepare your favorite pastry recipe. In a large mixing bowl, combine sugar, flour, tapioca, orange zest and nutmeg. Stir in rhubarb; let mixture stand while you make the crust. Prepare pastry: In a mixing bowl, stir together the flour and salt. Using a pastry blender, cut shortening into flour until pieces are the size of small peas.Sprinkle 2 tablespoons water over part of the flour mixture and stir gently with a fork. Push moistened dough to the side of the bowl. Repeat using 1 tablespoon ice water at a time using the 7-8 tablespoons total, until all the dough is moistened.Gather dough up into a ball and divide in half. Roll each half into a 11-12 inch circle, for bottom and top crusts. Place one crust in a 9-inch pie dish. Cut decorative slits in the top crust to allow steam to escape while baking. 2. Combine egg and water, mixing lightly with a fork. Add to rhubarb mixture, and stir to combine. Spoon into pastry-lined pie dish. Dot with butter. Add egg mixed with a little water to the sugared rhubarb. 3. Cover with top crust. Trim crust and crimp edges. Lightly brush top crust with a little milk or light cream, then sprinkle with coarse sugar for a nice browned top. Brush top crust with a little milk and sprinkle with coarse sugar..
4. Cover edges with foil to prevent over browning. Bake in a 375 degree oven for 30 minutes. Remove foil from edges, and bake another 30 minutes, until browned and filling is bubbly. SOURCE: Originally from a vintage cook book in my collection, with modifications by yours truly . Looking for a quick-to-make dessert for the weekend? This one is it! Smoothies are the “in” drink now-a-days. They can contain just about any combination of ingredients that are compatible and taste good together. All vegetables, all fruits, some yogurt, grains or seeds; the possibilities are endless. Most of us enjoy a smoothie because it’s cool and refreshing and if made with some thought to ingredients, can be quite nutritious. One of my favorite kinds of smoothie is made with strawberries, yogurt and almond milk with an occasional banana added for thickness. Today’s recipe for Berry Smoothie Pie grew out of my love of strawberry smoothies. Wanting to capture all the luscious flavor of fresh strawberries, but without the added sugar, I started with strawberry sugar-free gelatin. I dissolved it in cranberry juice, then added a small cup of strawberry blended Greek yogurt, and lots of sliced strawberries. I blended this all in the blender and poured it into a cookie crumb pie crust; let it chill until set, then served it with a dollop of low-fat whipped topping. I must say this pie is “berry, berry good”. It’s quick and easy to make, cuts cleanly, it’s cool and refreshing and tastes great. What more can you ask of a summertime desert? 1. In a small microwave-safe bowl, sprinkle gelatin over juice, let stand 1 minute. Microwave on high 40 seconds. Stir, and let stand 1 minute for gelatin to completely dissolve. 2. In a blender container, combine gelatin mixture, yogurt and berries. Process until blended and smooth. Pour into crust and chill 4 hours. Serve with whipped topping. SOURCE: This is a major revision of an old recipe from Taste of Home. “Can she bake a cherry pie, Billy Boy, Billy Boy? Can she bake a cherry pie, charming Billy? ” The answer to the question asked by that old song is…..definitely yes, if she makes this recipe. In honor of George Washington, and all folks who love cherry pie, this one’s for you!! So let’s get started. You won’t want to wait to dig in to this tart-sweet pie with a flaky crust that just breaks apart as you cut into it. But who cares what it looks like when the flavor is so fabulous. When I serve it I like to add a scoop of cherry vanilla ice cream, just because— :-). 2 cans sour pitted cherries (16 0z. each) Even better are fresh pitted sour cherries, if you have access to them. your favorite recipe for a double crust pie, or a package of refrigerated pie crust. Preheat oven to 400*F. Have ready a 9-inch pie dish. 1. Drain juice from the cherries and measure out 1 1/2 cups. Sift sugar, salt and cornstarch and mix with the juice. Place mixture in a medium sauce pan and cook for about 5 minutes to thicken, stirring often to prevent sticking. Add butter and almond extract. Remove from the heat. 2. Add the cherries to the thickened juice mixture, then pour into the pie shell. Cut decorative slits in the top crust and place on top of filling. Trim crusts, so top crust extends about 1/2-inch beyond the bottom crust. Fold top crust over edge of bottom crust and press together to seal. Flute edges with your fingers. 3. With a small amount of milk or cream, lightly brush the top crust, then sprinkle with about 1 Tablespoon of sugar. This will give the crust a nice glaze and make it very tender and flaky. 4. Bake at 400 *F for 45 minutes until filling starts to bubble up through the top slits, and top is nicely browned. You may need to cover crust edges with foil if they are browning too quickly. SOURCE: A clipping for this recipe has been in my recipe box for a long time. It came from an old magazine, done’t know the source. This recipe is about as American is mother’s apple pie. Because it IS apple pie, only in a non-traditional form. You don’t need a pie dish to make this pie, just a baking sheet. You can make this with Perfect Pastry Blend, for pastry that will be tender and flaky, or use regular all-purpose flour and your own favorite pie crust recipe. The slab shape offers each serving some extra crust for those who are especially fond of the crust, and the apple filling is thick and nicely cinnamon flavored. I used local Paula Red apples, but I don’t know how wide-spread their availability is, so use whatever kind of good pie-apple is coming on the market where you live. I made this pie for a special dinner when we were entertaining friends, and since I don’t have a tray or platter large enough to hold it I placed it on a hugh cutting board, and brought it to the table that way. It was kind of fun for my guests to see the whole pie, and watch me slice and serve it up with a scoop of vanilla ice cream with caramel syrup drizzled over all. There were only a few crumbs left on the plates so I know everyone enjoyed it. then sprinkle in the water, mixing until cohesive. Form pastry into two rectangles, wrap in plastic, and refrigerate for 1 hour. Form two rectangles, wrap and chill. 2. Preheat the oven to425*F. Lightly grease a baking sheet, or line with parchment paper. 3. To make the filling: Mix together all the ingredients except the egg. 4. Roll one piece of pastry into a 17″ x 7″ rectangle, trimming the edges. Roll the second piece into a 16″ x 6″ rectangle, also trimming the edges. 5. Place the smaller rectangle on the pan and brush with egg wash.
Bottom layer of pastry, brushed with egg wash. Spread the apple filling over the pastry, leaving 3/4 “- wide bare edges. Center the other piece of pastry over the apples and press down, crimping the edges to seal. Brush with egg wash and cut several vents. 6. Bake for 15 minutes, then reduce the heat to 375*F and bake for 12 to 14 minutes longer, until golden.